Ashari-lota or Asaria (capparis zeylanica, family : capparaceae) is a thorny woody profusely branched creeper. The plant grows on fallow land, especially in damp jungle in Bangladesh. Other Bangla names : Kalokra, Kalkeya, Kelekra. Leaves are simple, green, petioled, alternate, ovate, 4.5-7.5 cm and 3-4 cm wide. Flowers are white to pink, borne on axillary lateral inflorescence. Sepals 8, arranged in two layers. Stamens numerous, look like a cat's mustache, gradually change color from white to pink to deep pink. Flower blooms in February-March. Fruit is a berry, smooth, 5-7 cm long. The seeds remain inside in circular form. It gives fruit in the rainy season. The propagation is caused by the seeds. The fruit is edible. Crow likes it. There are hard and curved spines on its body. Leaves are used in piles, blister and tumour. Roots are used in pain, jaundice, tuberculosis, bone fracture and liver diseases. Kajubadam, Kaju or Cashew nut (anacardium occidentale, family : anacardiaceae) is an evergreen medium-sized (30-40 feet) leafy tree with spreading branches. Stem is crooked. 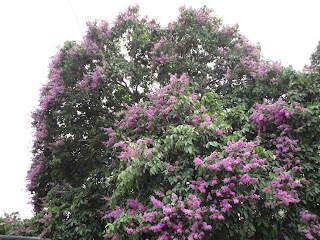 It is not indigenous in Bangladesh, though it has been planted in different parts of the country. Leaves are simple, green, 10-18 cm long and 6-10 cm wide, obovate, rough, entire, round at he end and narrow at the base. Flowers are small, yellowish brown, on terminal inflorescence. each cluster contains 400-1200 tiny flowers. Flower blooms in April-May. Male and bisexual flowers can be seen in a tree. Fruits are born from the bisexual flowers. Fruit is nutty drupe, kidney-shaped, about 2.5 cm long, grey, with hard cover. Immatures fruits are green, turns yellow and red when ripe. Seeds are found naked below the hanging fruits. Propagation is caused by sees and air layering. Gaab (diospyros peregrina, family : ebenaceae) is a short to medium-sized evergreen tree with spreading branches and dense leaves. Bark is blackish. The nice canopy-holder tree can be seen from Southeast Asia to Australia. It is found everywhere in Bangladesh. At the end of spring, the extraordinary red-brown leaves appear. This is one of the main characteristics of the plant. The entire tree looks great at that time. Leaves are simple, dark green, hard, smooth on upper side, petioled, alternate, lanceolate, 10-20 cm long and 4-7 cm wide. Leaves grow thickly on black branches. Dholshomudro (leea macrophylla, family : vitaceae) is an annual rhizomatous herb with large green leaves. The height of the plant is barely a meter. It can be usually seen in the edge of the forest in Bangladesh. Dented leaves are gigantic, beautiful to see. Edges undulated. Veins and midribs are clearly visible. It blooms in June-July. At the tip of the twig is borne large cyme inflorescence with huge number of flowers. Peduncle 30 cm tall. Flowers are small, soft, whitish, sepals 5, petals 5. Fruits are also small. Juveniles are green, matures are blackish, smooth. Young leaves are eaten as vegetables. Color can be made from the roots. Power of roots is antiseptic and cures sores. It also destroys intestinal worm and earth worm. In winter foliage part is destroyed and in March new plants rise from the rootstock. Buno Joba or Jongli Ghagra (urena lobata, family : malvaceae) is an erect branched plant with about 1.5 m height. The plant is covered with tiny hairs all over the body. Leaves are ovate, round or 5-7 lobbed, 3.5-12 cm long, irregularly toothed, covered with rigid hair. Petiole 2-8 cm long. Flowers are small, violet or pinkish, clustered or solitary, about 1 cm across. Calyx 5-cleft, petals 5, stamens many. The fruit is globose with 5 carpels and is covered with short stiff spines. It blooms almost in all seasons. It is found everywhere in Bangladesh. It grows in abondoned places. Root is used as diuretic and useful in neurological disorder. The flower is called Buno Joba (wild hibiscus) In Bangla. Joggodumur, Jagdumur (ficus racemosa, family : moraceae) is a medium to large deciduous tree (15-16 m) with branches. The florets of the tree remain inside fruit or fig and cannot be seen from outside. Figs are good vegetables. The good looking plant can be easily detected by its brilliant red fruits which grow in cluster on trunks or branches. Leaves are slightly hairy, green, elliptical-ovate, 14-18 cm long, petiole 1.5-2.5 cm long. Mid-rib and veins are clearly visible. Figs are hairy also, big, 2-4 cm across. Immature fruits are light green, bright red when ripe. They are nutritious. Propagation of the plant is caused by seeds. The plant grows in wilderness and on fallen lands. It is found everywhere in Bangladesh. Fruits, roots, leaves and bark are used in cut wound and different tooth diseases. Its latex is used to prevent blood dripping.